As part of the rebranding to HV Open it was time to simplify the platform for the website at the same time. I had a few requirements going into this. There had to be a way to sync to meetup. I hate double data entry. It should be mobile friendly / responsive. The server costs to maintain should be low. That’s both hardware resources, but also the time it takes to do regular security maintenance of the software stack. All the old meeting urls had to be maintained (even if through redirects). People put these in their resumes showing that they have public speaking experience. The 3rd generation of the website was based on Drupal, which worked well for us. But it was started under the idea that more user generated content would be hosted there. The reality is, that never really happened. Also, at the time I was maintaining a Drupal site for the Poughkeepsie Farm Project, but they migrated off of that nearly 5 years ago. I had originally intended to make the 4th generation be based on Wordpress. I maintain an instance for my blog. Wordpress’ auto update functionally makes staying up to date on security patches easy. But, after contributing to Home Assistant and Kubernetes docs, I decided to make a late change and go with Jekyll instead. Jekyll is a static site generator written in Ruby. One of the more well known in the space. The source is a bunch of annotated markdown files, then it compiles HTML out of it. Like any compiler, you pay a cost up front for that, so builds take noticable time (especially once you import the 180 old events). However, that build time means a quite quick website on the other side. It took about a week to find a base theme that worked for me. There are tons of Jekyll themes out there, but most of them focus on blogs, resumes, or product pages. I needed a relatively un-adulterated bootstrap theme. I eventually found (Jekyll Clean)[https://github.com/scotte/jekyll-clean]. The site is a fork of that respository, though modified enough that it’s origins are not obvious. I did look at some other static site systems, but two things made my decision. Jekyll is designed to be extended, not just with custom tags, but in a number of ways. I’ve now written 2 plugins for Jekyll (more below). Secondly, two of the projects I contribute to use Jekyll, so anything I learn here can be applied there. Jekyll has a concept of posts (blog posts) and pages out of the box. But you can also build custom types via the collections mechanism. For HV Open the custom types are events and locations. With the gen3 website, I realized that we only really have about 6 locations we ever do anything in. It’s much easier to provide the information about a location once, and reference it in events. That means the location page can include a map if people want to drill down that far. In the gen3 site that was a custom google map, but with the greater control in gen4 I can use leaflet.js and have pretty maps based on Open Street Maps. Events are key. We have 12 meetings a year, 12 lunches a year, 4 leadership meetings, and then sometimes want to cross promote with other groups. Events drive the front page (what’s next, what’s coming). Events also need enough information that we can sync them to meetup. That means 2 dates (start and end), location field, and types. These custom types live under _events and _locations in the repository respectively. I’ve written two custom plugins for Jekyll for the hvopen site, one for mapping, and one for ical. The map plugin is used on location pages to inject a custom leaflet.js map for those pages. It’s build as a custom tag that you insert in pages (or layouts) where you want a map. In the old system, I had hand crafted a Google Map and embedded it via an iFrame. Now this can be done by providing enough metadata in a location that it can be rendered on the fly in a leaflet map. That includes not only the location pin, but the optional parking marker as well. Leaflet is backended by Mapbox, which uses Open Street Map data. The calendar plugin provides an ical feed for upcoming events. That provides a portable way to export our events to other services. This was a walk back in time to the ruby icalander gem, which I was once a maintainer. The calendar plugin is a jekyll generator, which creates a static page early in the rendering process, that is then copied into the site for publication. This took a little more effort to figure out, and some reading of the jekyll source code itself. Examples around generators are more scarce. The primary purpose of the website is to make it easy to find out about upcoming events. One of the ways to do this was to be better about structured metadata that search engines, social networks, and message services use. An article from the slack team about unfurling was rather inspiring there. That means there are open graph and twitter card tags in every event. 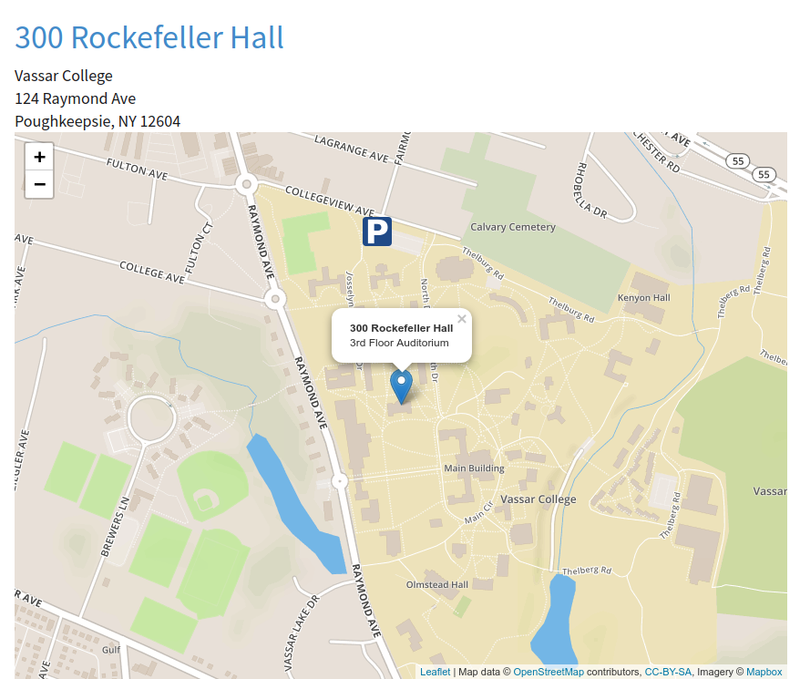 "name": "300 Rockefeller Hall 3rd Floor Auditorium"
These are embedded in every event page header and make the pages more machine friendly. Some of this may start popping up in the way the site is displayed in google once the great reindexing is done. We started using meetup about 8 years ago as a way to find new members. Meetup is good about cross promoting events based on geography and interests. But the last thing I ever wanted to do was have to enter events into multiple systems. In the gen3 site I wrote a custom Drupal plugin that updated meetup inside the save hook. While Jekyll does support custom commands, because of the way this is hosted (more in a minute), this is always going to be an offline activity. But it shouldn’t be harder than running a simple sync command. I wrote a sync script in python. The script takes a single argument, which is the event source file that should be synced. If it already has a meetup_id in it’s frontmatter header, this is an update call. If not, it creates the event, which returns a meetup_id, and rewrites the file with it included. Meetup posts support a very limited set of html (which does not include header tags or lists), so this does substantial massaging to make the meetup post be legible. There is a wrapper shell script that will look through recent git history for changed events, and call out to the sync script. That will eventually end up under cron control, though right now it’s manual. In contributing to the Kubernetes Docs I discovered Netlify. They automate the process of building static sites like this. Once of their services is rendering draft output on pull requests, making it much easier to review documentation pull requests. But, they also offer hosting for static sites in their CDN infrastructure. That includes managing SSL certificates via letsencrypt, as well as optimizing assets for faster load. I decided to embrace that, given that if anything happens with their service we could easily retarget to local hosting in about 24 hours. The slideshow for upcoming events is also now hosted in their infrastructure at live.hvopen.org. Before hvopen.org went live, I wanted to make sure all the old meetings were imported, and that their urls from the old site still worked. I was able to build a json export view of all the old meetings, and a tool which took that and wrote them out. The trickiest part of this was scrubbing and converting the html for the posts into reasonable markdown. The graphical editor for Drupal makes some weird decisions about whitespace at time that I had to regex clean up. Maintaining the stable urls is done with the jekyll-redirect-from plugin. The redirects are listed in the frontmatter header, then when the site is generated it builds a set of redirect pages at all the old urls. That ensures that anyone who has listed their talk at MHVLUG in the past in a resume or article won’t have a broken link. Any migration is imperfect. We have not yet moved over older meeting notes (we probably will) or non meeting events (we probably won’t). There are also some broken images in the old meetings because not every image file has been brought over. That’s going to be a slower fixing process as we go. The entire website, including all the custom code I talked about, is up on github. Contributions are welcomed as pull requests, which allow netlify to build the proposal and make sure it looks right before we merge. If you want to fix a broken link or a typo or anything else, please do! It’s been a very interesting learning journey thus far. There are things I love about Jekyll, like how fast the site is to load for people. It’s consistently sub second response now, the best I could get on the Drupal stack even after pretty aggressive caching was 3 - 4 seconds. I love how extensible it is, and that with the level of control I have in the templates and plugins it’s actually very easy to get a site to be exactly what I want. Full CMS stacks have so many layers between content and rendering that it’s often hard to get that. I don’t love the build speed for local development, which seems to have non-linear slow down on the number of events in the system. At 180 events we’re at about 4 minutes on a local build (depending on your hardware). Unfortunately you can’t do the render in parallel. I’ve worked around that with a _config_fast.yml which excludes all events prior to 2018. I also found the documentation on Jekyll extremely lacking. The plugins page talks about the different kinds of plugins, but typically provides only one very simple example. Everything I was trying to do was more complicated than that, so I ended up having to just read a lot of existing jekyll plugins, and the jekyll source code to figure out how to do things. It’s one of the advantages of open source, I could do that, but it would have been nicer if I didn’t have to. Also the jekyll docs don’t replicate anything in the liquid template docs, so you typically have to have both pages up in tabs and flip back and forth between them to build a unified list of tags in your head. Documentation that’s this normalized is easier to maintain, but much harder to consume. Overall I’m very happy with this choice, and that when I did need to extend jekyll I could do it without modifying core code. I also love how fast it is for users, and will put up with it being a little slower to build locally for me.